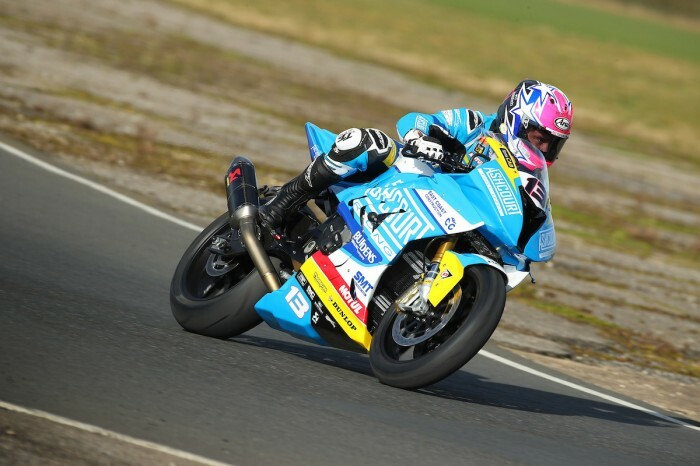 It’s fair to say Lee Johnston has a spring back in his step ahead of the 2019 International road racing season and going back to what he knows best is the formula he hopes will yield success, particularly at the Isle of Man TT. Keen to make his mark and step up a level this June, Johnston will campaign the striking blue Ashcourt Racing BMW and Yamaha machines this year and with a successful recent test at Monteblanco, he’s raring to get his season underway. “I feel really good and we got through a lot of stuff with both bikes in Spain and going back to what I know has already relit the fire,” Johnston told bikesportnews.com. “Last year was tough but I’m in a good place mentally and feel very comfortable with the team around me where I’ve got a lot of experienced guys supporting me. I’ve already said that I need to be fighting for the podium at the TT and that’s the only way I’m looking at this year’s event. “I ride against all the riders at the other road races and can mix it with them there so why not do the same at the TT? I know I’ve underachieved there in the past but I’ve stopped looking at what other riders are doing and are simply looking at what I’m doing now. “I’m fully focused on myself and not worrying about what other people are doing. I’ve done that in the past and it’s been detrimental to my results. After a year with the official Honda Racing team, Johnston will be back on a BMW for the 1000cc classes, the bike which gave him his first podium around the Mountain Course with third in the 2015 Superstock race. It’s also the race where he set his personal best lap to date with a speed of 130.851mph, something he’s eager to better this time around. I’m not sure if we’ll see the 134-135mph speeds we saw last year as it was a bit of a freak year in terms of the weather being perfect all fortnight – it’s rare to get that two years on the trot at the Isle of Man. “That’s easier than it sounds though particularly when you’re my size – my weight works against me and I’m mid-air most of the time compared to the other lads. They’re already on the power before I’ve landed back in the seat. Johnston will also revert back to Yamaha power for the Supersport class and although he’s yet to race the new R6, he’ll be making a return to the British Supersport Championship this year and is convinced the extra track time will be of benefit to him at the TT. “The tests in Spain have gone really and the benchmark at the TT is Hutchy who hasn’t done a bad job there on the Yamaha has he? I did a 127.2mph lap on one of Clive’s Honda’s last year but with the amount of time I’ll have had on my Yamaha this year, I’m confident of bettering that.